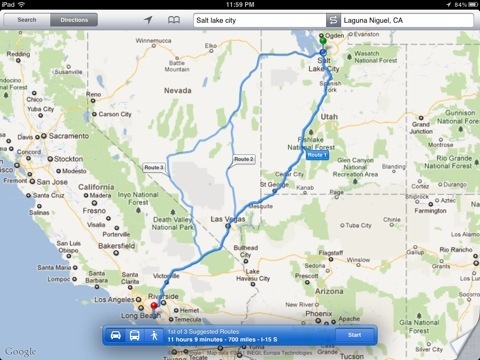 This mind-numbingly long drive brought to you by Google Maps. I decided to start this blog because I thought it would make a sort of bridge between my homeland, SLC (I can still use that! It’s our word), and my new home in Orange County, California. I can compare the two, like Utah apples and California oranges (or maybe I heard once you’re not supposed do that). I mean, we Utahns are pretty unique, right? What with our antiquated liquor laws, love for multi-level-marketing, and gettin’ hitched right out of high school. I wonder what kind of nuttiness I’ll find in Orange County? I hear it’s pretty conservative, but the super “Christian” kind as opposed to the Mormon variety we grow here in Utah (no, I’m not saying Mormons are not Christians. I’m also not saying they are. What do I know? I read Oprah’s book club for spiritual guidance). And so, stay tuned here at this simple little blog, which I will try super hard to keep updated, for ruminations on leaving Salt Lake City, musings on settling in Southern California (almost said “The OC” again! ), and other thoughts in between. To conclude, I’ll leave you with some items I think may make good blog posts in the future. Dear God it’s Ten-and-a-Half Hours to Drive Here! You Can Buy Booze at the Chevron! Remember When Every Corner Had a Mormon Church and Not an El Pollo Loco? Dear God it’s Ten-and-a-Half Hours to Drive Back!